Red Smith is the most respected sports columnist we’ve ever had. In his prime, Jimmy Cannon, Smith’s friendly rival, was certainly as well-known. Cannon, the Voice of New York, was an emotional, colloquial writer whose reputation, unfortunately, has faded. But Smith endures. What is it about his writing that ages so well? The Library of America presents Smith’s finest work in the new collection, American Pastimes: The Very Best of Red Smith. It is available now and a must-read for all sports fans, young and old (and an ideal gift for Father’s Day). This week, with permission from Smith’s family, we’ll reprint a Red Smith column every day to offer you a sample of what he was all about. 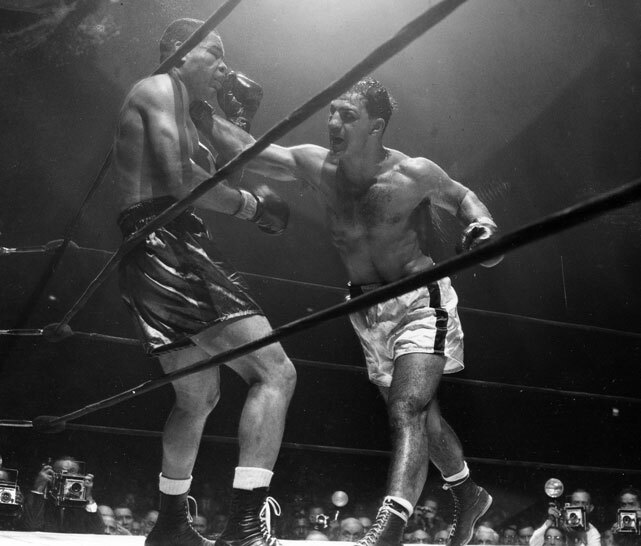 Today’s column is “Night for Joe Louis” which ran on October 27, 1951, the day after 27-year old Rocky Marciano knocked out 37-year old Louis. So, enjoy, and for more on Smith, check out this oral history from Jerome Holtzman’s classic, No Cheering in the Press Box; this excerpt from Stanley Woodward’s memoir, Paper Tiger; a nice tribute by his son, Terrance Smith; and this excerpt from Dan Okrent’s introduction to American Pastimes. Course it goes without saying that if you want to know from Red Smith you need to go find a copy of Ira Berkow’s excellent biography, Red. "It is easy to say, and it will be said, that it wouldn’t have been like this with the Louis of ten years ago. It isn’t a surpassingly bright thing to say, though, because this isn’t ten years ago. The Joe Louis of October 26, 1951, couldn’t whip Rocky Marciano, and that’s the only Joe Louis there was in the Garden." "easy to say?" for him,maybe. Alex - comparing him to Mo is aboute as good a comparison as you have EVER made. Well said!